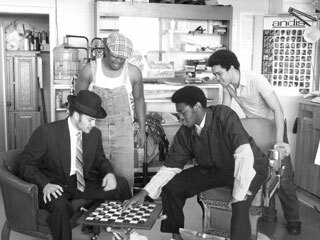 Ceremonies in Dark Old Men, a 1965 drama by Lonne Elder III, chronicles the struggles of the Parker family in their efforts to overcome the debilitating effects of ghetto life. The family drama Ceremonies in Dark Old Men will be performed by the African American Theater Arts Troupe February 20-22, one of many UCSC events marking Black History Month. "Ceremonies in Dark Old Men is a black American classic," said Don Williams, director of the Theater Arts Troupe. The play was the first he directed when he founded the troupe 13 years ago, he noted. The drama centers on the relationship of a father, his two sons, and daughter. An injury prompts the father to set up a barbershop in the basement of his home to earn some money, and the daughter becomes the family breadwinner. Originally set in the 1960s, the UCSC performance will be set in the 1970s, but remains timely, said Williams. "This is reality. You go to any major city, and you see this lifestyle." It was written in 1965 by playwright and screenwriter Lonne Elder III, who was nominated for an Oscar for his adaptation of the classic children's story Sounder. The African American Theater Arts Troupe is a student-based organization made up of artists from a variety of backgrounds and majors. Over the years, Williams said, the visibility of the program has grown and theater arts majors now dominate the cast. "This year is unique in that out of seven actors, six are theater arts majors," he said. The troupe was formed as a vehicle to create unity, higher visibility, and understanding of African American culture, encouraging the celebration of ethnic diversity and cultures at UCSC and in the larger community through both educational and creative outlets. Through its productions and campus and community collaborations, the African American Theater At s Troupe formed the African American Student Scholarship Fund at UCSC, giving out annual awards and providing over $50,000 in scholarship funding since 1992. At the City on a Hill, there's a small educational group full of big potential: The African American Theater Arts Troupe. As a perfect offering during Black History month, the university drama group will perform the play, "Ceremonies in Dark Old Men," during the weekend of Feb. 20-22 at the UC Santa Cruz Second Stage. The story, set in Harlem 1965, is about a man named Mr. Parker who has two jobless sons and a daughter. When Parker's first career as a vaudeville dancer and singer went sour with leg problems, he opened up a barbershop in the basement of his brownstone home. His wife has passed away and his daughter returns from college with a mission to get the three men "on the right track." '"The moral of the story is it gives you a snippet of a look at African-American life, not sugar coated, not Cosby," says director and UCSC theater arts staff member, Don Williams. That's exactly the reason this troupe exists: Williams launched it 13 years ago when he recognized a hole in the theater arts offerings to students, especially to those of color. Unfortunately, there aren't too many black students on campus-maybe a few hundred men and the same for women. Yet in the theater department, Williams says, there are about seven black men and six black women. That's part of the reason why he chose this play, written by Lonne Elder III. It especially gives young male thespians roles they can really bite into. Thespians like Wes Adkins, an 18-year-old freshman studying film and theater. He stars as the 56-year-old Mr. Jenkins, the comedy relief character in the story who plays checkers with Mr. Parker. "There's a lot more to this play ... than meets the eye," Adkins says. "At first it seems the black men in the house are being lazy and then you realize there's emotion behind it.... Society won't let them have decent jobs. It's a play about strong men and [strong] people in general." There are only two female roles in the script, but they too are independent and stalwart. Adelle is the daughter who comes home, puts her foot down and tells it like it is, most definitely making a statement. "That's a true depiction .. of AfricanAmerican women," Williams says. "There's a mighty strength in them." In exposing the power of black women, yet also the hardships of black families living in New York, this play goes deep into the trenches of honesty. It's far from any Hollywood production that slaps a smile on hardships. After 13 years of doing this-offering plays written by and often starring African-American students--Williams plans to keep exposing Santa Cruz to what life in black America really looks like. 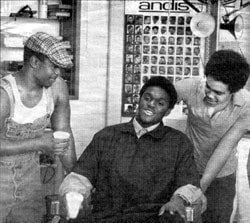 Set in a Harlem barbershop, it is the story of an African American family living in New York in the early 1970's. The play recounts the struggles of the Parker family and their efforts to overcome obstacles such as racial. stereotyping. "The conflicts they face are the same ones that a lot of people of color face today in 2004. It's a story many can relate to," said Mr. Donald Williams, Research Assistant and Director of Rainbow Theater/African American Theater Arts Troupe. Ceremonies in Dark Old Men was the play that led to the formation of AATAT 13 years ago. Williams remembers students approaching him when he first started working at UCSC. "They had a strong desire to perform, but no outlet," said Williams. The group ended up working afterhours and on weekends to make their first performance of Ceremonies in Dark Old Men a reality. "I remember getting steps, walls and various pieces of furniture that were getting ready to be tossed out," said Williams. "We put them together and put on the show with no budget." The performance ran for one weekend at Stevenson College. Every night after the show people gave donations, which built up the AATAT financial foundation to create the African' American Student Scholarship Fund at UCSC. The fund now gives five $1,000 scholarships a year and has given over $60,000 since the troupe's pioneer production in 1992. Rodney Ridgel, a UCSC student playing the part of Mr. Parker in Ceremonies In Dark Old Men, received one of the scholarships this year. 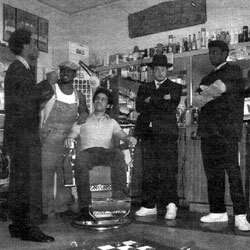 barbershop, as a proud man, who is drawn into illegal business to support his family after the death of his wife. "Mr. Parker illuminates some of the feelings on living and trying to work for the man during this time," said Ridgel. Lonne Elder W first wrote and presented Ceremonies in Dark Old Men in 1969 at Wagner College, Staten Island, New York. Elder entered the New' Jersey State Teachers College in the' 1940's, but. left before the end of his first year, moved to - New York at 19 and continued his education there. He became active in movements for black equality, which motivated him to write short stories and poetry. He later became associated with the Harlem Writers Guild, a community of writers of African descent whose mission is to preserve the experience of black people in the written word. "He wrote this in a time where- history was changing. It was performed shortly after Martin Luther King Jr. was assassinated,"
Evans encourages all students to come see this performance and believes everyone could benefit from seeing it because it is a reflection on real life. "As one of the characters says in the play, you bite, climb, scratch and you still' die anyway," said Evans. "This family deals with many things building up based on their skin color." The question, she says is "How is it that they are going to be able to break down those barriers and become something stronger?"